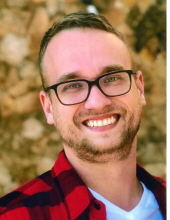 Mr. Joshua Grant Bailey, age 28 of North Wilkesboro passed away Friday, February 1, 2019. Mr. Bailey was born September 6, 1990 in Wilkes County to Aubrey Scott and Debra Kaye Church Bailey. He worked for Lowe’s Home Improvement and was a member of Truth Community Church. He is survived by his parents; Scott and Debra Bailey of North Wilkesboro, daughter; Peyton Lane Bailey of Millers Creek and son; Jaxton Reece Bailey of North Wilkesboro, two brothers; Garth Bailey of Holden Beach and Garrett Bailey of North Wilkesboro and fiance’; Adrienne Severt. In lieu of flowers, memorials may be made to an educational fund benefiting Joshua’s children; Peyton and Jaxton. Contributions may be made to the Local Government Credit Union, PO Box 700, Wilkesboro, NC 28697 – Fund # 40289959. To send flowers or a remembrance gift to the family of Joshua Grant Bailey, please visit our Tribute Store. "Email Address" would like to share the life celebration of Joshua Grant Bailey. Click on the "link" to go to share a favorite memory or leave a condolence message for the family.